Cleveland native Mike Watts debuts as Bengals preseason TV voice on Aug. 9. With Brad Johansen's departure for Raleigh, N.C., Bengals fans will see and hear a new preseason TV play-by-play announcer for the team's game against the Chicago Bears at 7 p.m. Thursday on WKRC-TV. Meet Mike Watts, just 25 years old, but who already has a very impressive list of ESPN credentials calling professional and college soccer matches (including FC Cincinnati). Plus, he's done Big East, American Athletic Conference, Atlantic 10 and Patriot League games, as well as play-by-play for Saint John University and Fordham University basketball, soccer, lacrosse, baseball and softball. 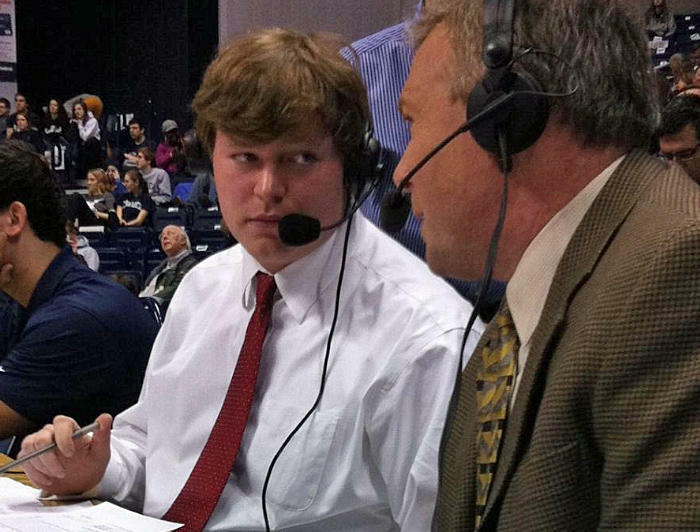 Mike Watts interviews Brad Johansen before a college basketball game in 2013. Watts also has worked for Fox Sports, YES (Yankees Entertainment and Sports Network), SEC Network, the Atlantic 10 Digital Network, the National Hockey League (as a digital asset coordinator) and the Elias Sports Bureau (as a research intern). I wanted to lay that out first, before telling you he's a Cleveland native and Browns fan. "I grew up in Northeastern Ohio. Sundays were planned around Browns games. We'd go to church at 11, and watch the Browns at 1 p.m." says Watts, a 2011 graduate of Saint Ignatius High School and a 2014 Fordham grad. 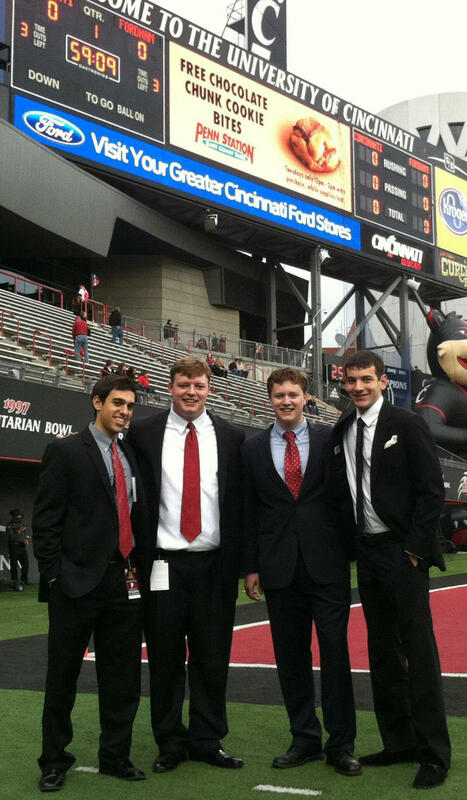 Mike Watts with WFUV-FM's Fordham University broadcast team before the 2012 Rams-Bearcats football game at Nippert Stadium. Watts will commute from New York to do three preseason Bengals' local telecasts with Hall of Famer Anthony Munoz and sideline reporter Mike Valpredo: Thursday, Aug. 9; 7 p.m. Saturday, Aug. 18 at the Dallas Cowboys; and the Colts here 7 p.m. Thursday, Sept. 30. Fox will broadcast the Bengals at Buffalo Bills 4 p.m. Sunday, Aug. 26. "I'm coming in to try to do the best I can. If I do a good job, hopefully they'll want me to continue" in future years, he says. "The Bengals found me, actually. I saw Brad was changing markets, but didn't know that it meant the Bengals would be going in another direction," says Watts, who lives in Queens. A month after a coworker told him the Bengals TV job was open he got a call from Brian Sells, Bengals vice president and chief marketing officer, and another from Bengals TV executive producer David Ashbrock. "We had some conversations about my background and my philosophy and hit it off quickly," Watts says. 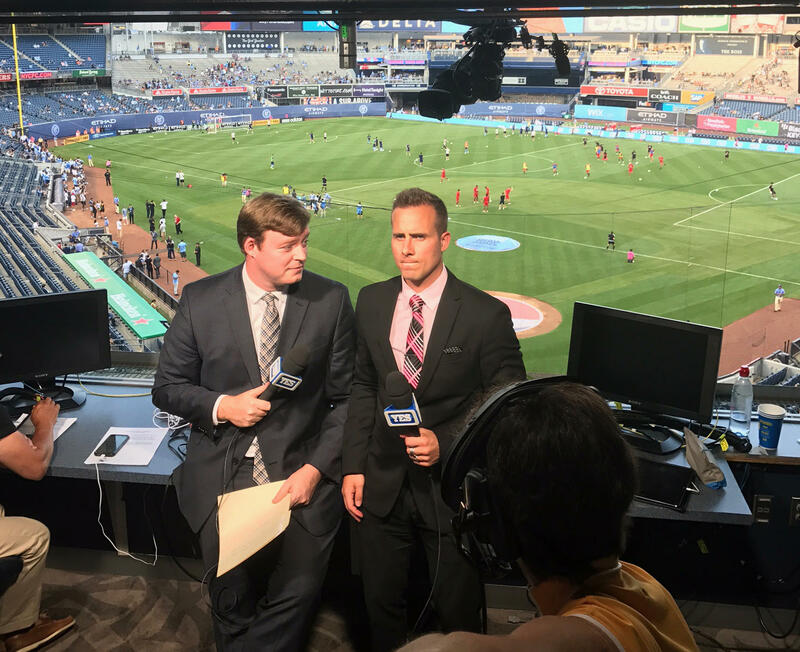 Mike Watts and Ian Joy prepare to do a soccer match at Yankee Stadium for the YES Network. Ashbrock describes Watts as a "passionate, hard-working over-achiever who has earned a chance to step up to the NFL." He came "recommended to the Bengals by the NFL." While the Bengals were evaluating options, Ashbrock received two unsolicited endorsements for Watts. One called him among "the most prepared announcers you'd every find;" the other came from "a leading play-by-play announcer who appears regularly on NFL Sundays who personally called me to speak on Mike’s behalf." 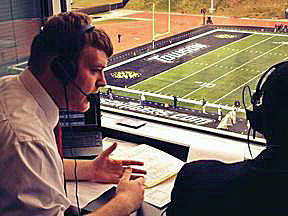 As a freelance announcer, Watts has aggressively assembled a variety of sports gigs to build his resume. When we spoke, Watts was in Orlando preparing to call an eight-team weekend soccer tournament on ESPNU and ESPN2. Mike Watts calling a football game. He's also done play-by-play for the United Soccer League's game of the week on ESPN2/ESPNU/ESPNEWS/ESPN3, including the FC Cincinnati-Charlotte match July 18. He also hosts the weekly SiriusXM show, USL Coast to Coast. "I guess this is what dreams are made of," Watts says. In high school, he covered more than 250 games for the Saint Ignatius Broadcasting Network. While at Fordham, he called more than 100 games in various sports while also serving as sports manager, anchor, sports talk host and as a beat reporter at WFUV-FM, Fordham's NPR affiliate. 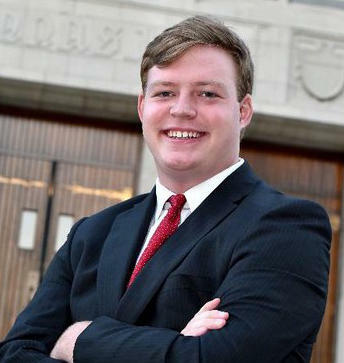 Watts earned a finance degree in three and a half years at Fordham, but he's only used his class work as a summer intern at Klingenstein Fields & Co., a New York wealth management company. "I'm having too much fun doing this," he says. At 25, he's a year younger than when Al Michaels made his major-league debut as radio voice of the Cincinnati Reds with Joe Nuxhall in 1971. "The one thing I figured out in three and a half years of college is that every opportunity came when I was ready for it. These things happen when they're supposed to," says Watts, who dreams of being a NFL announcer some day. "It's not lost of me how early (in my career) this is happening. It took the right fit. I look at this situation and say, 'I'm so blessed.' "
Update noon Tuesday, Aug. 7: Yes! 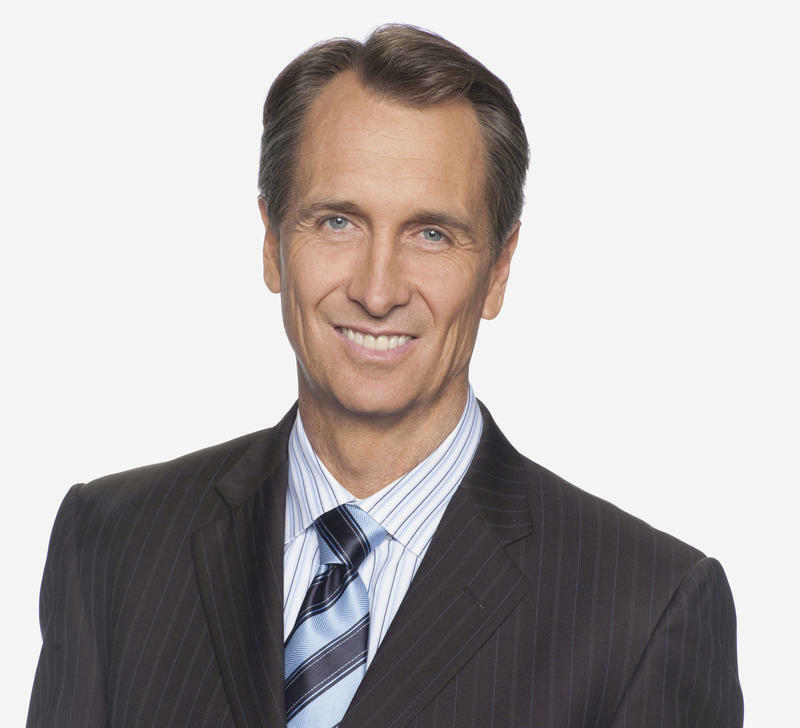 A Football Life producers have found video of Cris Collinsworth racing a bay horse at Latonia Race Course in 1983, and video of Collinsworth's Wilmbledon features for HBO, his first sports broadcasting. The NFL Network also has set the date for the Collinsworth episode.